Lapel pins and challenge coins play an interesting role in today’s military. 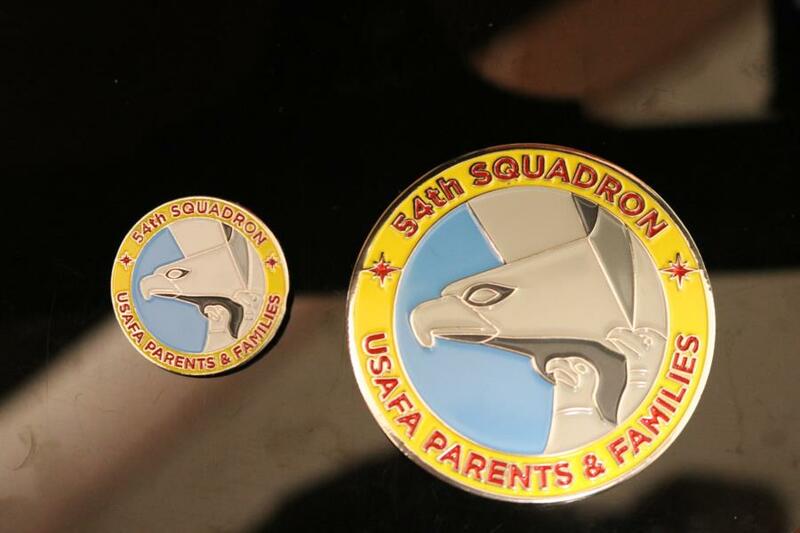 Parent & Family Giving carried longstanding USAFA and military traditions into the design of its 54th Squadron lapel pin and challenge coin. Lapel pins are status symbols in the U.S. military, each telling a unique story about the person who possesses them. During the Civil War, soldiers wore a brass pin with their unit number. This was a way for everyone to tell the units apart. It was also used to build loyalty and camaraderie among the members of each unit. By the onset of World War I, the lapel pin process had changed. Instead of everyone automatically receiving a pin, individuals received them for exemplary service on the battlefield. A challenge coin is a small coin or medallion (usually military), bearing an organization’s insignia or emblem and carried by the organization’s members. Traditionally, they are given to prove membership when challenged and to enhance morale. In practice, challenge coins are normally presented by unit commanders in recognition of special achievement by a member of the unit. A challenge coin is usually passed to the recipient during a handshake. Every class is identified by one of the four Academy colors (red, blue, yellow, sliver) with the incoming class assuming the color of the most recently graduated class (e.g. the Class of 2021’s color is silver). Because every cadet — current and graduated — identifies with a class color, the 54th Squadron challenge coin and lapel pin incorporates all four. Learn more about Parent & Family Giving, the 54th Squadron and the traditions it embraces, and the impact you can have on the Academy by visiting the Parent & Family Giving website.